First of all, do not confuse yourselves in contemplating this novel to be a romantic fiction, portraying a lover and his “beloved”. No! Not at all. 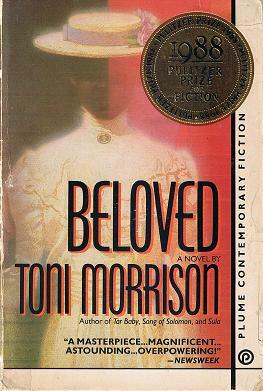 In fact, this intriguing fiction by Nobel Prize winner, Toni Morrison is about the barbarous history of slavery of ‘Black People’, back in the time during the 18th Century. The cruel treatments of Black folks by White people, Slave trade laws, racial discrimination and the haunting re-memory of the past are the main themes of this fiction. Rather than, giving us the account of “slavery and it’s repercussions” in a very monotonous manner, Morrison takes up the very genuine story of a black slave woman, naming, Margaret Garner, who actually killed her own small child, to keep it free from the prevailing brutal slavery and it’s aftermath. Morrison includes supernatural interventions to fabricate this authentic story and makes into a very poignant as well as the very marker of the history of Afro-American. The fiction moves around an ex-slave Sethe, a black woman, who escaped from her earlier slave home, named Sweet Home in Kentucky, with her 3 children and 1 new born-baby, who took birth during her escapade and now lives in Cincinnati, Ohio. After 18 years from that escapade, those haunting memories of slavery still haunts the present of Sethe and her daughter Denver. Apart from loosing so many significant persons in her life, she also lives with the pain of the loss of her two year old baby, Beloved.That escapade really cost a huge amount from Sethe, she is right now, living with her 4th no. daughter, Denver in a house that is haunted by the ghost of the baby (Beloved), she killed, in order to save her from slavery. Now, after all these years of living with Beloved’s ghost, both Sethe’s and Denver’s almost stable life shudders with happiness and nostalgia, when Beloved’s ghost appears in the form of a full-bloodied woman. Thus, what is the purpose of this ghost appearing after 18 years of her killing has to do with Sethe and Denver’s lives, is what all we see in this fiction. Not only the haunting by the ghost, but also the ‘shocking & shaking’ truths about slavery and the experience of that homicidal past through a woman’s eyes, is what makes this novel a “Pulitzer Prize” winner. A must read novel to experience the ghostly truth of slavery in America! !